9ct yellow gold, small polish flower stud earrings, set with a central cultured freshwater pearl. Timeless elegance, these stunning 9ct gold stud earrings will complement the look of every outfit. 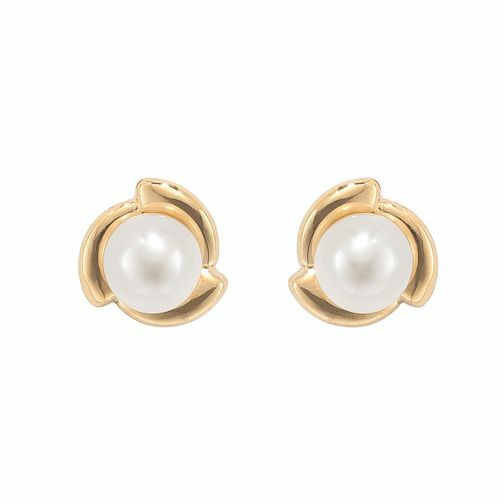 9ct yellow Gold Cultured Freshwater Pearl flower Earrings is rated 4.7 out of 5 by 3. Rated 4 out of 5 by Anonymous from Good buy for gifting and office use This is a good buy to gift someone. It could easily be used for office wear. I ordered two pairs of these online and these were delivered on time.